This Article presents an original analysis of newly available data from a landmark survey of 4387 low-wage, front-line workers in the three largest U.S. cities. We analyze data on worker claims, retaliation, and legal knowledge to investigate what we call “bottom-up” workplace law enforcement, or the reliance of many labor and employment statutes on workers themselves to enforce their rights. 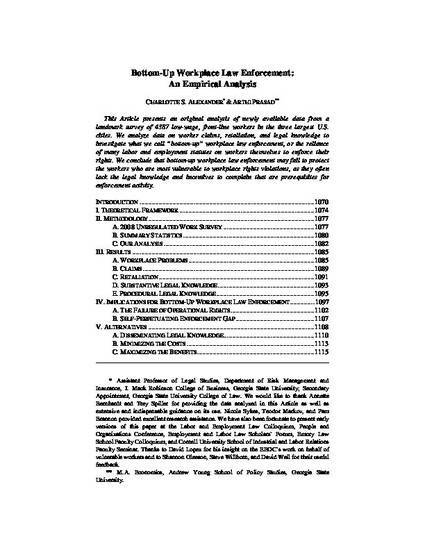 We conclude that bottom-up workplace law enforcement may fail to protect the workers who are most vulnerable to workplace rights violations, as they often lack the legal knowledge and incentives to complain that are prerequisites for enforcement activity.